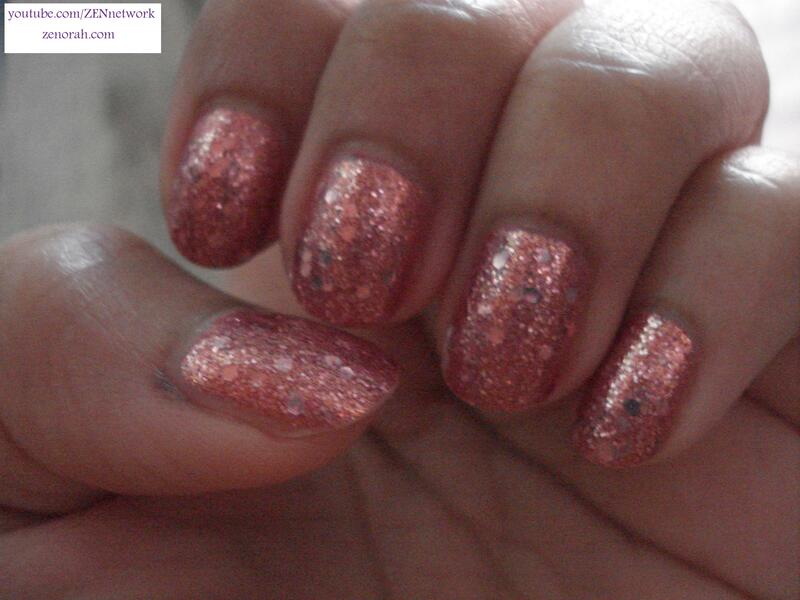 Zoya Tiffany – is a gorgeous peachy pink shimmer infused with a TON of gold fleck and shimmer particles. This polish was originally released in Zoya’s Flame 2010 Winter Collection, I am certain you can order on their website but I am not sure what the availability is like in store. I got mine when it was first released and I could not contain my excited because it was the ‘perfect’ polish to wear year round – it was some what neutral yet perfect for nights out on the town! I really do love this shade A LOT and is one of the few Zoya shimmer polishes that I think everyone would love! Be prepared for a TON of pics of this combo as it was difficult to capture the beautiful result – but in this picture you can really see the golden particles jumping off the nails – it looks amazing in sunlight and I would definitely have placed this polish in more of a Summer Collection rather than a Winter Collection. It took two coats to achieve a full opaque manicure and I saw minimal tip wear over the course of the three days in which I wore it. It felt like I could jazz it up a bit and for some reason I was feeling to wear a glitter – reached into my collection and decided on Revlon Sparkling. Now I am not a huge glitter lover – but this combination really bought out a huge appreciation for a good glitter polish! 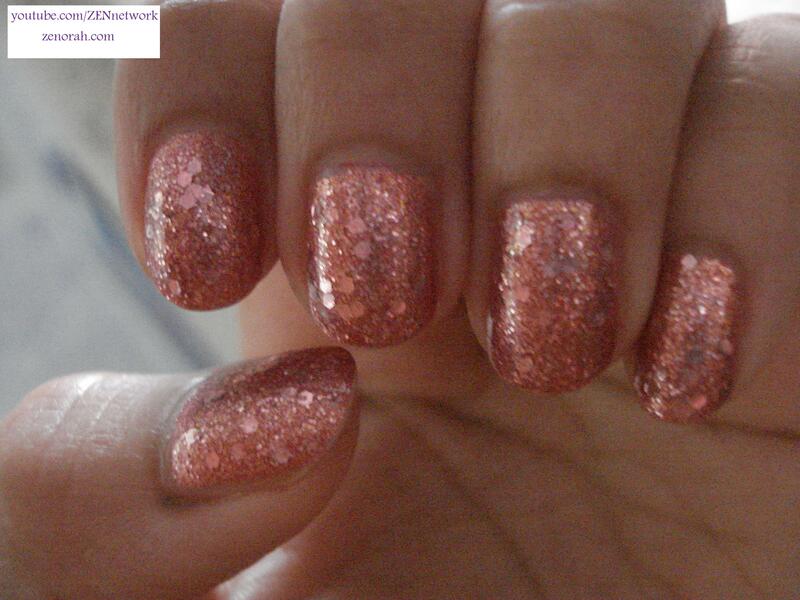 Revlon Sparkling – is a salmon-pink multi-sized glitter polish in a clear base. Depending on the light and how you tilt your hand the glitter particles can appear to have a silver reflect – this polish is suppose to be a dupe for Deborah Lippmann polish (I can’t say if they are dupes as I don’t have the Deborah Lippmann) and Essie A Cut Above from their Luxe Effects Collection (which I do not own). I ADORE this manicure so much I am actually wearing it as a pedicure currently and I love the way it (for lack of a better word) sparkles in the sunlight. The different size glitter particles really compliments the golden shimmer particles in the Zoya Tiffany polish which resulted in MANY compliments when I wore this last week. This is what it looks like without flash – I think it’s absolutely gorgeous!! This is two coats of the Revlon Sparkling over two coats of the Zoya Tiffany and for a 4 layered manicure this baby lasted a LOT longer without chips or dents than I thought. I saw tip wear and chips around the forth day of wearing it, but seeing as I had on the Zoya Tiffany 3 days prior and this manicure lasted ONE FULL WEEK on my nails, I’m pretty happy about that. And if I haven’t changed a polish after day 3, it’s definitely something special. I highly recommend both of these polishes and this combo opened the door for me to use some of my neglected glitter polishes. You guys know I’m more of a creme polish girl but this might be the year I become glitter obsessed! Do you own Zoya Tiffany + Revlon Sparkling? What are your thoughts on these nail polishes? Thank you =) i highly recommend this combo! would look amazing on you.